Percy Wayman informs Miss Berry that Mrs. Carrie Chapman Catt has been given the Pictorial Review Achievement Award. He then invites her to a luncheon in her honor and asks for a RSVP. 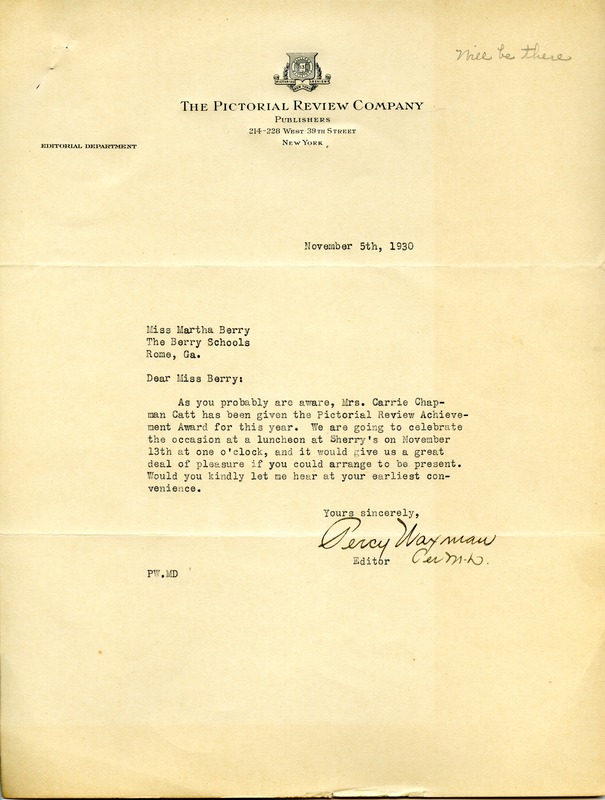 Percy Wayman, “Letter to Miss Martha Berry from Percy Wayman.” Martha Berry Digital Archive. Eds. Schlitz, Stephanie A., Jordan Brannen, Allison Moore, Chelsea Risley, et al. Mount Berry: Berry College, 2014. accessed April 25, 2019, https://mbda.berry.edu/items/show/13724.